Past memories influence emotions and emotions motivate action. Learning the connections helps us identify when pasts and emotions are interfering with desired futures. Twirling through experience is the past, present and future. Just as light filtered through a prism, the present moment projects colors into the future. Neither the past, present nor future can be satisfactorily understood without the compliments of the others. Here we are continually stuck in the middle of what has been, and what will be—the glorious emotional present. We envision ourselves (mind, body, spirit) as unified wholes. Consciousness is felt as a single experience, not as the complex bits and pieces that composes final perception. Our sense of stability relies on the security of control. Our coherent perception diminishes anxiety. We believe that this constructed vision of self is a reality. The self is much more complex than simple constructions and labels, dynamically changing and reacting with life. 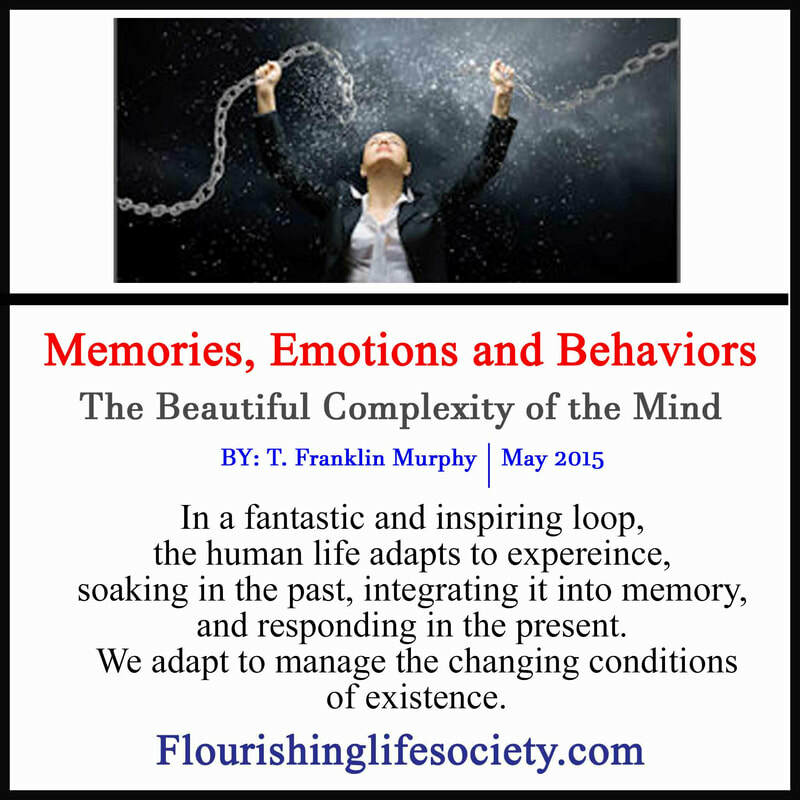 Although new experiences appear neatly packaged, supporting our personal narratives, they are really globs of complex information flowing through multiple sensory modules and extensive and diverse memories. These lenses conform to our biases, shaping the world we experience. The body responds emotionally to life. Life affirming experiences evoke happiness, pleasure and joy. Threatening events evoke sadness, fear, and anger. We remember emotional experiences; emotions give the happenings of life meaning, coloring events with feeling. Naturally we seek more pleasure and less pain. We do this in several ways. Our responses to external triggers are adaptations. Our adaptations vary in effectiveness—some shortsighted escapes and others complicated constructions with lasting benefits. We learn to mitigate discomforting emotions, keeping life within bearable limits. If a behavior hurts, we avoid it. We learn not to touch hot pans, attack unstable martial arts fanatics, or openly lie and cheat to loved ones. By binding in our mind actions with the probable consequences, we direct future choices, navigating a chaotic world. Some fail to make connections or rely on faulty connections weakening logical choice. Others become blind to futures chained to destructive habits and impulses; the utility of choice has deteriorated into a meaningless impulsive drive devoid of future considerations. Action isn’t the only response to enhance pleasures and escape pain. Our mind gets involved, manipulating the facts, and reconstructing the past. We often interpret experiences to relieve discomfort. Escaping reality through thoughts relieves pain. Sometimes these mental maneuvers are necessary, preventing emotional overwhelm that floods our system and we lose control, destroying our futures. The unconscious assistance of a moderating mind saves us much sorrow. Mental and physical survival demands we respond to threats of security, self-worth, and independence. Emotions surge through the body to motivate effective action. When no viable options are available, the biological system becomes depressed and shuts down. Our mind keeps stirring, mulling over facts, seeking an answer. Too much stress without a reasonable escape and we cower in helplessness. At a young age, the child begins to construct a world of meaning. Experiences of both pain and pleasure instruct the child, forming theories of cause and effect. Imagine the confusion of a child in a chaotic abusive home, seeking to attribute the pain to his own action. The poor child can only establish control in his mind. The youngster is empowered through imaginations. Using defense mechanisms reality is softened, keeping the psyche intact. We all use defense mechanisms to adapt—mostly unconsciously. These learned approaches work, avoiding pain, and reinforcing self-power. When a mind trick works, we return to it—automatically. New experiences resembling difficult pasts set in motion a familiar cycle of emotions and adaptations to create security, protect self-worth, and establish independence. Memories from the past quietly rewrite the present to conform to past drama behind the conscious curtains of our mind. "Too much stress without a reasonable escape and we cower in helplessness." Consciousness can’t be denied. It joins this milieu of bodily excitement; when emotions stir, automatic mechanisms kick in, and behaviors playing out, the conscious mind provides the explanations—giving words to the nonsense. Thinking justifies the feelings, defenses and behaviors. We often misinterpret meaning, missing key components, unconscious contributions, and subtle biases. We explain experience in a self-friendly manner—usually. Some, however, prefer self-harming explanations. The true cause of the experience and emotions remains a mystery, often the emotions are simply a relic of the past rather than an accurate appraisal of a present threat. Accepting ugly pasts disrupts tranquility. Opening wounds isn’t a glorious discovery. It silently suggests personal flaw. To maintaining stability, we blame outside causes, pointing at partners, governments and strangers. We throw the punch and deny responsibility. And it makes perfect sense. Going to battle, spewing vinegar, to fight the self isn’t the answer. Self-hatred, often carried from imprints of the harsh parenting of our pasts, suppresses personal insights. We hid aspects of the self to avoid our punitive reactions. Others discount emotions—battling for supremacy of mind over body; but this further disrupts the emotional-behavioral cycle; we lose trust in the intelligence of natural guides. Even when emotions are misguided to a present situation, they still play point to something amiss in our lives. Emotions point to self-understanding, empathy and social connection. We must accept our emotions to create authenticity and connect with ourselves and others. Through greater self-awareness, we integrate conflicting and confusing emotions. Felt experience observed with curiosity, unveiling triggers, offers deep insight and invites compassion. We can welcome feelings openly and honestly. This inclusive response to experience frees us from blindly following emotional pushes—we become a student of experience. The greater awareness expands self-understanding and broadens our capacity for compassion. By shifting our relationship with emotions, we regain freedom and become effective masters over our lives.